So my colleague Nick has thrown down the gauntlet, and I accept his challenge. Cute Baseball Babies it is! 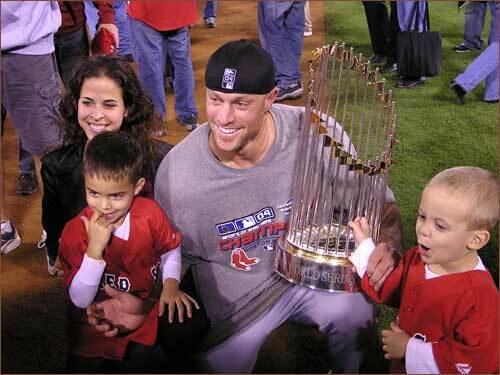 I started taking note of CBBs when I saw the photo below, appearing shortly after the Sox won the 2004 World Series. While Gabe’s li’l tykes are probably no longer small enough to properly be called “babies,” since this is the photo that started it all, we will begin with the Kapler kids. Honestly, would anyone expect less-than-adorable offspring from this couple? Of course, adding to their familial cuteness is the fact that Gabe and Lisa have their own organization combating domestic violence. Stand-up guys are always cuter. That Lisa Kapler is one lucky woman. That Gabe is one lucky guy!